We created this CALL TO ACTION to let you know that the Printmaking Center of New Jersey (PCNJ) needs your help to keep the positive momentum of the past several years flowing forward! PCNJ has become the “go-to” destination for professional artists working in all areas of printmaking, papermaking, book arts, letterpress and digital media. Our open studios are fully equipped and well-stocked. Staff is knowledgeable, helpful and engaging. World-class instructors from far and wide teach beginner, intermediate and advanced workshops. The Gallery consistently exhibits dynamic works on paper, and we’re making a positive impact in our community with special programs for veterans, youth, and other sensitive populations. Last year, PCNJ was fortunate to receive several grants that helped us expand Combat Paper and the Roving Press, so we could reach new constituents. These large grants were once-in-a-lifetime opportunities that can’t be repeated. Program restricted grants are very useful, but PCNJ also needs a sustainable source of general operating funds. In order to support our staff and monthly operating expenses PCNJ has developed a plan to increase earned revenue from programs and services. To accomplish this goal, we are making necessary upgrades the studios to increase studio rentals, publishing and contract printing. A three phase renovation project over the next year will add air conditioning in the lower level papermaking and silkscreen studios, and will bring new cabinets and counters into the main floor etching studio. The upper level gallery will become a dual purpose space, both as exhibition space as well as a state-of-the-art lithography and etching studio for contract work, collaborative editioning, and publishing. The space will also be available for rent by the week or month as a private studio for visiting artists. Ensure our stability in times of economic uncertainty by increasing the cash reserve to cover a minimum balance of six months of operating expenses. Ensure that our staff are fully supported with competitive salaries and health insurance benefits. 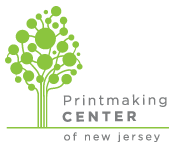 You, our members and patrons, play an essential role in strengthening this precious resource so the Printmaking Center of NJ is available for future generations of artists. Another way to donate while you shop is to set up an iGive.com account. Follow this link to set PCNJ as your charity of choice and then, whenever you use member businesses, a portion of your purchase is donated to us. It's easy to support PCNJ by simply shopping on Amazon Smile and selecting PCNJ as your charity of choice. Amazon donates 0.5% of the price of eligible AmazonSmile purchases. Same great prices, with a terrific benefit to us! Members can support PCNJ by increasing their annual membership dues to become a Sustainer for a contribution of $100. You will receive a presentation print and our sincere gratitude. Join PCNJ’s community of printmakers who enjoy full 24/7 access to the studios. Keyholder fees are an affordable rate of $650 per year, which is less than $2 per day! Serving on the PCNJ Board of Directors is a fulfilling way to give back to your community of printmakers. See details about our current members and how to get involved here. Created to promote participation in a wide array of volunteering opportunities, the PCNJ Volunteer Core has opportunities to suit every skill level and time constraint. Join the Core! Setting a gift to PCNJ aside in your Will ensures that the next generation of printmakers will have the same quality services and programs that you have treasured. This summer, PCNJ begins a three phase renovation project to upgrade our facility in Branchburg. As each phase is completed PCNJ will create an opportunity to “name” each studio – Papermaking, Silkscreen, Digital Printing, Letterpress, Etching and Lithography Studios. Naming opportunities will begin at $5,000. Please join us as we celebrate printmaking at several annual events that directly support PCNJ’s operating expenses. Be sure to check out our fundraising events page for the Summer and Fall fundraisers as well as many other opportunities! This ground-breaking program is reaching veterans throughout New Jersey and beyond. Make a sustaining donation to underwrite its powerful impact on veterans.